E Light Electric Services, Inc.
" Our human brains are hardwired in certain ways and one of those is that we retain things that we write down better than the things we hear or read. We also add stress to our processes when we try to memorize things. If you just repetitively write down the Article Numbers and Names, you are getting the benefit of retaining it without the stress of trying to memorize them. " If you are ready to make the commitment to prepare for your test, then how should you spend that time? 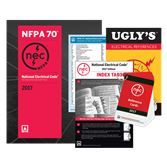 Being able to find things quickly in the National Electric Code is critical to your success on the exam. There are many ways to improve your code lookup efficiency. One of them is to use the Targeting Method which we will discuss as we continue and another is to know where to begin your search. The NEC is divided into Chapters and each chapter is divided into Articles so that topics can be categorically arranged. Knowing the article number helps narrow your search and increases your efficiency. The best way to do is to first take some to memorize the names of the 9 chapter titles of the NEC. The second is to be able to identify the correct Article for the topic quickly. I have passed along the following trick that was taught to me many years ago by my Grandfather to help to help my students increase their code lookup speed. 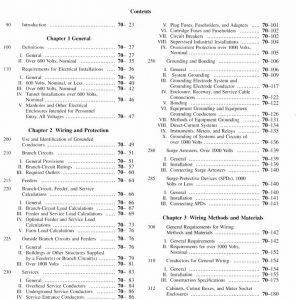 The first exercise I recommend is to sit down with an NEC and turn to the Table of contents. Take our a blank piece of paper and pen and write down the first Article Number and Article Title in Chapter 2 of the NEC and then continue that process until you have written down all the Article Numbers and Titles in Chapter 2. Then take the paper, ball it up and throw it away. The next time you sit down, do the same thing for Chapter three. Then repeat the process with Chapter 4 the next time. Continue doing this until you have finished Chapter 6. Then start over with Chapter 2. This exercise only takes a few minutes and it is very helpful .. A couple of Tips: Don't write them down and then read them over and over and try to memorize them. Just write them down and throw them away. Then keep doing that until you have been through Chapter 2-6 at least 4 times. Here is what will happen. You won't have the article titles memorized, but if someone says to you "Power and Control Tray Cable, " you will blurt out 336. It will just pop into your head. Our human brains are hardwired in certain ways and one of those is that we retain things that we write down better than the things we hear or read. We also add stress to our processes when we try to memorize things. If you just repetitively write down the Article Numbers and Names, you are getting the benefit of retaining it without the stress of trying to memorize them. Two Minute Drills are something that I developed and copyrighted back in 1999 to help my apprentices prepare for their licensing exams and I have continued to use them with great success. The exam is based on a pace of 3 minutes per question. The exam also includes many calculations which may take you longer than 3 minutes, so you need to get your code lookup skill to the point that you can find the correct answer to a question in 2 minutes or less consistently so that you will have time for your calculations. Two-minute drills are timed so that each question remains on the screen for 2 minutes and then transitions to the answer. When all the questions are complete, the questions repeat without the timer so you can find the ones you missed. Using these two-minute drills will help you increase your speed and it will also register a 2-minute length in your brain subconsciously but only if you do them regularly and do a lot of them. Having 2 minutes linked in your brain with the act of looking up answers to questions in the NEC will help you avoid the biggest mistake test takers make when taking their licensing exam which is taking too long for a single question. The test questions are not weighted. Every question is worth 1 point. If you take 10 minutes finding one answer, you will receive 1 point but you will use the time you need to find the answer to three questions and loose 3 points. If you use the two-minute drills, you will find that it will feel like you are taking too long once you get to 2 minutes. If you feel you are taking too long to answer a question on the test, then you are. Skip that question and move on. You can always come back to it later if you have time and if you don't have time later, come back to it and guess either B or C. This only works if you have programmed your brain understand that it should take you 2 minutes to find an answer. My students often tell me that two minutes is not a lot of time. It doesn't sound like a lot of time but try this: Stop reading and watch you watch for two minutes and don't do anything else and you will find that 2 minutes is actually a pretty decent amount of time. Here is another exercise to think about. Dentists tell us that we should brush our teeth for 3 minutes. Try actually brushing your teeth for 3 minutes every day and you start to realize how much time this is. Practice Exams are practice tests which we have made for you that use a similar system to the system you will use on the actual test. These are untimed and when you have completed you will receive your score and also the correct answer and code reference for each question. Using these exams will help build your confidence in taking the test and provide excellent practice. We also have one 100 question practice test which contains questions in the same percentages that are used on the real exam. I recommend that you set aside 4 1/2 hours on one day, a week before you take the test. Set up a place that is quiet, where you will not be disturbed. Using only a calculator, some scratch paper and your code book,. take the 100 question test in one session. Don't take any bathroom breaks, smoke breaks or stop the test for any reason. Just take the test, just like you would the real test. This will help you prepare for the actual test and will also give you a great deal of confidence for the actual test day. 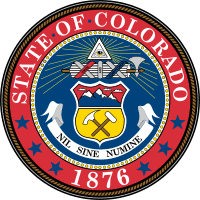 The information contained on this page is intended for the use of Employees of E Light Electric Services, Inc. Duplication of this material may only be done with the explicite written consent of E Light Electric Services, Inc.